I invented a new, delicious, quick-and-easy, healthy recipe tonight: Grilled Vegetable Mini Pizzas! Place tortilla on a piece of aluminum foil. Spread on tomato sauce and sprinkle on cheese. Toast in a toaster oven for 3-4 minutes, or until cheese has melted and the edges of the tortilla are crisp. Cook a handful of spinach in the microwave until wilted, about 30 seconds. Finely slice your other veggies (like eggplant and tomato). Season them with a dash of balsamic vinegar and Italian seasoning. Grill on a George Foreman grill for about 2 minutes or until cooked through. When everything is done cooking, top the pizza with the vegetables and eat! If it’s too messy, you can fold it in half to make a calzone! 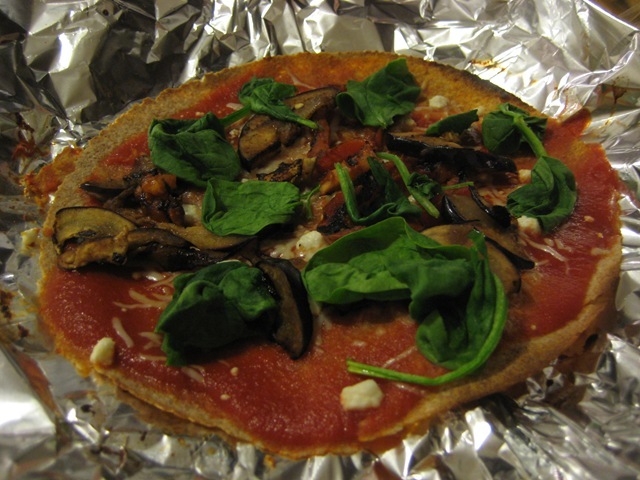 This entry was posted in Family and Child Nutrition, Healthy Recipes and tagged george foreman grill, Grilled vegetable pizza, healthy pizza recipe, healthy recipe. Bookmark the permalink. You have a really marvelous way to spin an interest in veggies and fruits and make it FUN to prepare! This one looks Fabulous and one I can’t wait to try. You have SOOO many great ideas! I can’t wait to become a regular reader and recommending your website to others as well! Summer is coming (eventually) can’t wait to see what you come up with for us to enjoy….. more fruits and veggies please! Thank you, Teresita!!! More fruits and veggies… coming up!